In England, before our nations War of Independence, a man was born by the name of John Paul Jones. He was made fun of in school, so he became a sailor at the age of 13. He rose quickly through the ranks and became captain of his own ship and was a privateer for the Royal British Navy. When the Revolutionary War broke out, he took the colonials side and quickly took his ship to join and form the Continental Navy! Jones chose to captain the ship Bonhomme Richard. In my painting, his ship is the one with the “John Paul Jones flag” with blue stripes. Jones misunderstood what the American flag was supposed to look like and made his own! Google it! One day in British waters, Jones found himself in The Battle Of Flamborough Head against the British ship HMS Serapis. In pirate fashion, he headed straight to the port side of the Serapis to board it and fight a hand to hand battle. When the 50-cannon Serapis opened fire again and again, Jones’ ship was damaged beyond repair. The British captain shouted out to Jones asking if he wanted to surrender. Jones next words became infamous! “I have not yet begun to fight!” Jones and his sailors took the Serapis capture and left their Bonhomme Richard, which was now burning and sinking, and sailed to peaceful waters with the rest of the Continental Navy. John Paul Jones rose from being a bullied kid and pirate sailor to being “The Father Of The American Navy”! Imagine having the determination to sail straight into the teeth of 50 cannons firing at you and not be afraid or surrender! Even though his own ship sank, he won the battle and the naval war! 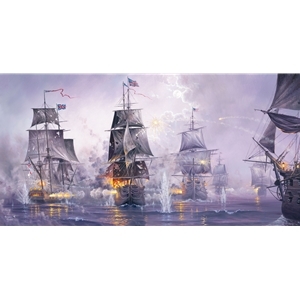 This painting depicts that moment when the Bonhomme Richard catches fire and he continues to fight back and sail on with his fleet behind him! It reminds me of the scripture “run with endurance the race that is set before you”. No matter what you’re facing, keep going and against all odds, you will win the battle!